I tried monochromatic coloring last night. I had so much FUN! This image is from Bountiful Blessings set (TSG) and I colored it with Copic Markers. I was very satisfied with my coloring, and of course, I had to create a card with it. Mmmm.... the position I stamped the sentiment was not good... :( But I think this card is so-so. lol! Thank you for stopping by today! I'll be here tomorrow with my guest DT card for a Japanese challenge blog, and also show you a new digi image! Today, I have two CAS cards using In Stitches set that will be available at the TSG store this night! I have some more ideas about how to use In Stitches set in my head! The possibilities of this set are ENDLESS!!! >> In Stitches "Happy Holiday"
I loved the simple layout of Barbara's card that we have to case, so I followed it. And I used the color combo from Color Throwdown 116. I thought it was good idea because Barbara is one of a DT member of the Color Throwdown Challenge blog. :) I hope you like it! Today, TSG Tips & Trick sheets using the brand new stamp sets will be posted on the TSG blog. Make sure to visit the TSG blog to check them out!! 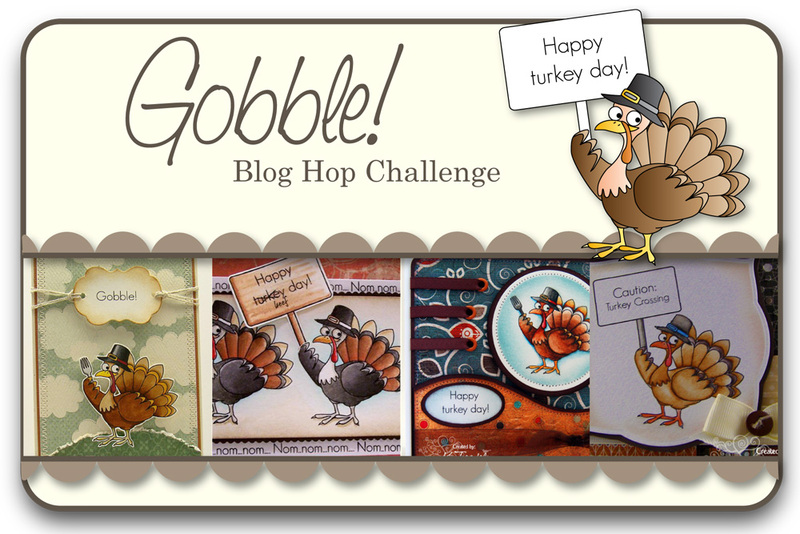 Just in case you have not completed this month's blog hop challenges yet, you have time until 4:00 PM Saturday (PST). I hope you enjoy your hop! Thank you for stopping by today. Have a happy Friday! 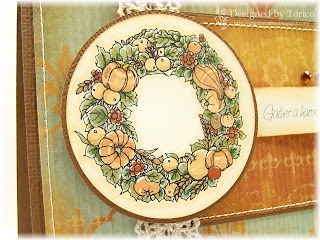 Welcome to the final day of this month's TSG sneak peeks! 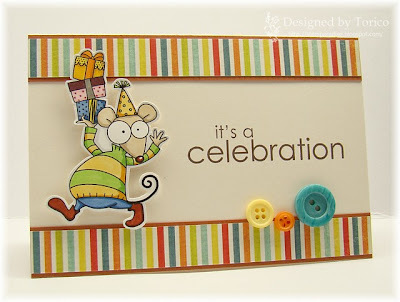 Did you come here from super talented Trendsetter, Sandar's blog? If so, that's great. Today, I'm sooooo excited to show you this set, "Snowy Days"!!!! I'm so grateful that many many people love the "Puppy Love" set I illustrated a few months ago. That cute puppy has come back for you!! He has already made ready for winter. lol! From skiing and snowboarding to hanging out with a snowman pal, he will warm your heart just in time for the holidays. 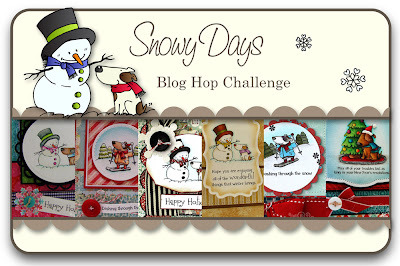 ﻿Would you like a chance to win the Snowy Days stamp set? 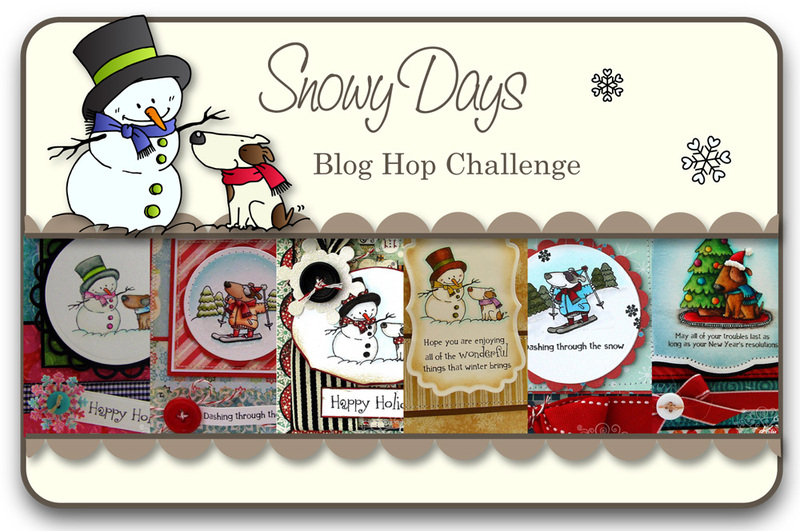 Here’s what you need to do- go to each of the Trendsetter’s Blogs and leave a comment on their Snowy Days Blog Hop Challenge post. After you have finished checking out the eye candy and have left some love, return to the TSG Blog and add your name to the Mr. Linky. 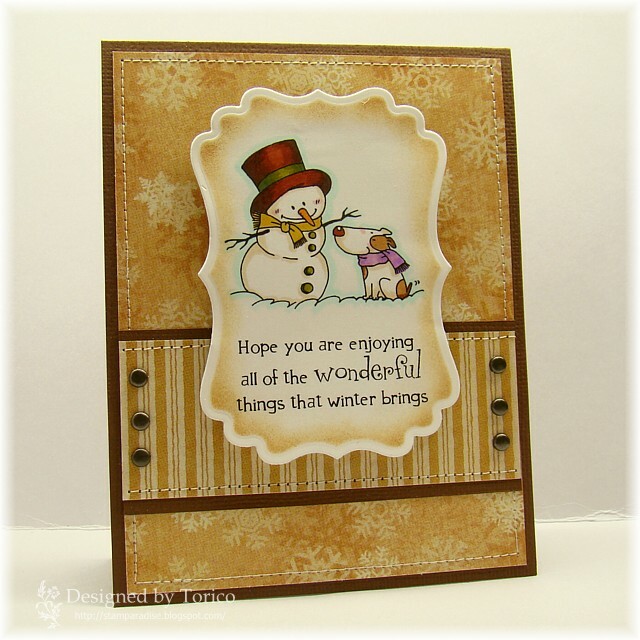 A winner will be chosen randomly using a random number generator to receive their very own Snowy Days stamp set. The winner will be announced Saturday (Oct. 30th) during the Release Party Chat. 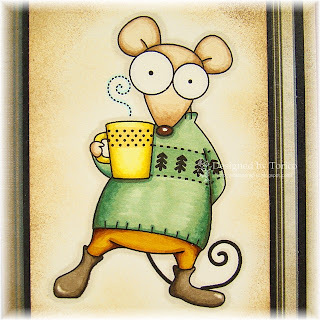 Sadly, here is the end of this month's blog hop. Thank you so much for playing with us! I hope you all like the stamp sets that will be released on Saturday. 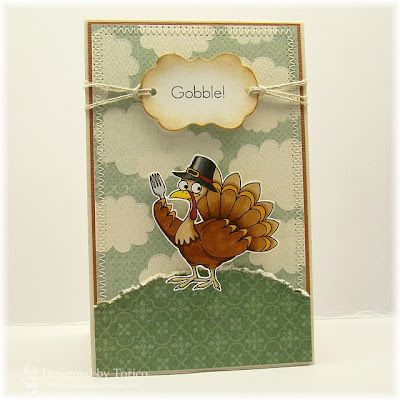 Today, we are showing two stamp sets, "Gobble!" & "In Stitches". The first one is called "Gobble!". Actually, I'm not familiar with Thanksgiving day as I'm a Japanese. But I know that most of US and Canadian people enjoy gorgeous dinner with their family on this holiday. The turkey I illustrated for this set can hold a sign designed to say 7 different sayings. And also, he has his glass and fork ready just in time for the big dinner!! Gobble is a 3x4 stamp set that includes a total of 13 of stamps and will sell for $7. The next one is "In Stitches". 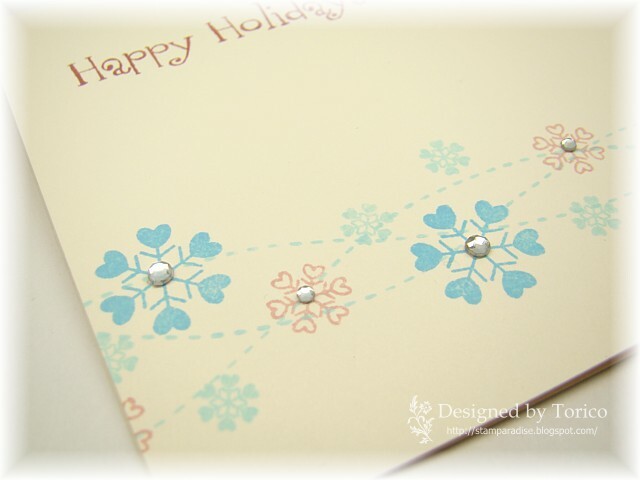 One of the biggest trends in stamping right now is using a sewing machine to stitch directly onto your hand stamped cards. 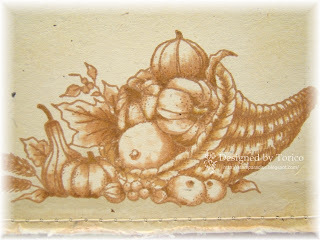 While this technique gives a very detailed look, it can be a little frustrating trying to master! No worries, TSG is here with a quick and easy way to get that stitched look you love! 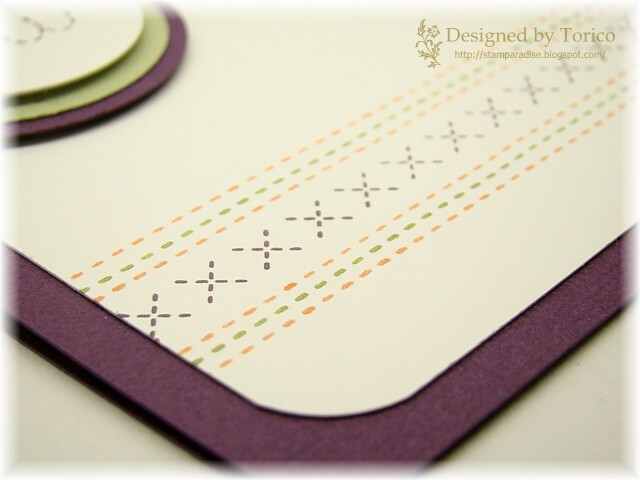 This mini set not only has some beautiful silhouette border images but it also includes two styles of stitching that will give you that stitched look you are after. I have to apologize to you for not having a sample card for this set today. :( But I promise to show you a card using this set in a few days! 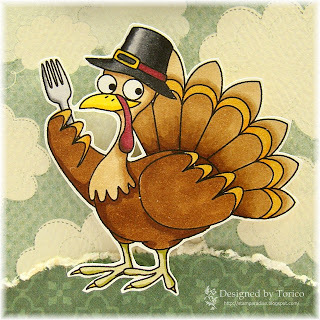 Would you like a chance to win the Gobble! / In Stitches stamp sets? 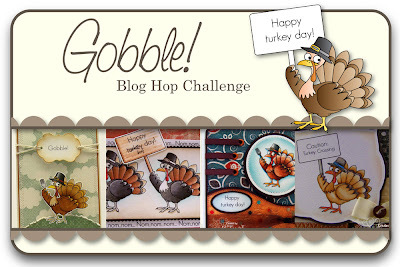 Here’s what you need to do- go to each of the Trendsetter’s Blogs and leave a comment on their Gobble! 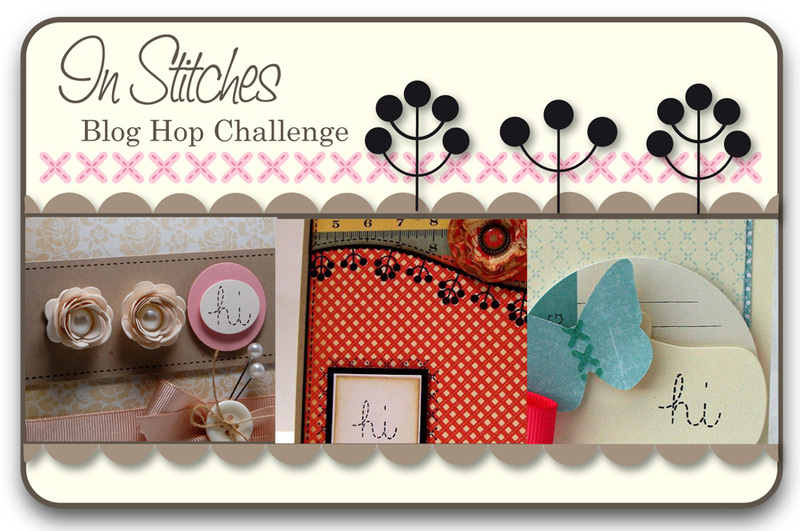 / In Stitches Blog Hop Challenge post. After you have finished checking out the eye candy and have left some love, return to the TSG Blog and add your name to the Mr. Linky. A winner will be chosen randomly using a random number generator to receive their very own Gobble! / In Stitches stamp set. The winner will be announced Saturday (Oct. 30th) during the Release Party Chat. Thank you so much for stopping by! See you tomorrow! 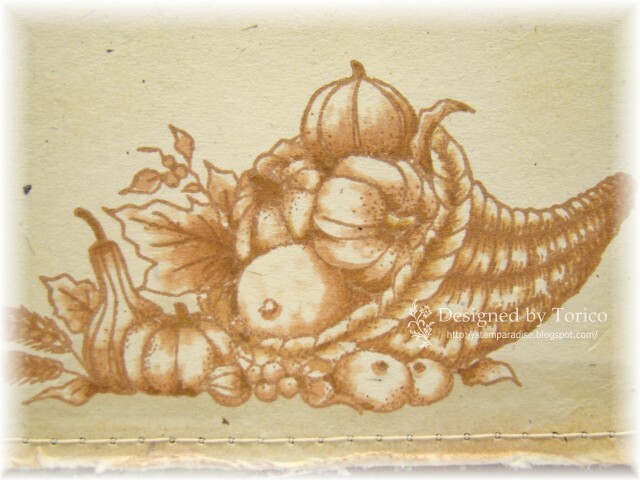 The stamp set we are showing you today is "Bountiful Blessings" that I illustrated. With the holidays just around the corner, it is only natural to really think about all of the amazing blessings in your life. 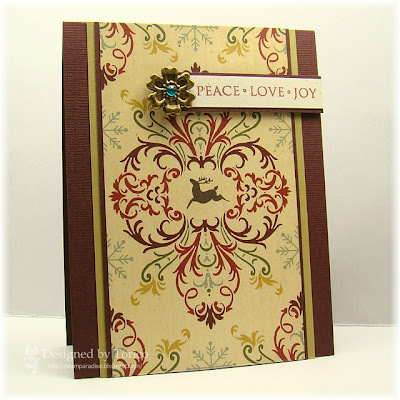 This set is perfect for creating cards to give to those in your life that bring you joy! 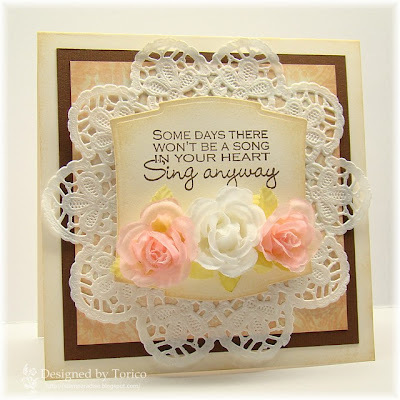 Would you like a chance to win the Bountiful Blessings stamp set? Here’s what you need to do- go to each of the Trendsetter’s Blogs and leave a comment on their Bountiful Blessings Blog Hop Challenge post. After you have finished checking out the eye candy and have left some love, return to the TSG Blog and add your name to the Mr. Linky. A winner will be chosen randomly using a random number generator to receive their very own Bountiful Blessings stamp set. The winner will be announced Saturday (Oct. 30th) during the Release Party Chat. Here is the end of today's hop. Thank you for playing along with us today and I hope you have enjoyed our creations! Please head back to the TSG blog and add your name to the Mr. Linky! 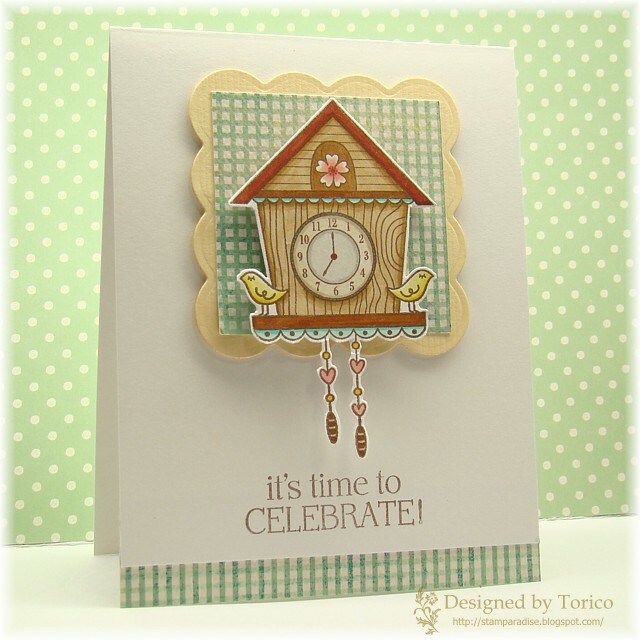 Tomorrow is day 2 of TSG sneak peeks, and we'll have sneak peeks of two mini stamp sets. Make sure to check them out!! 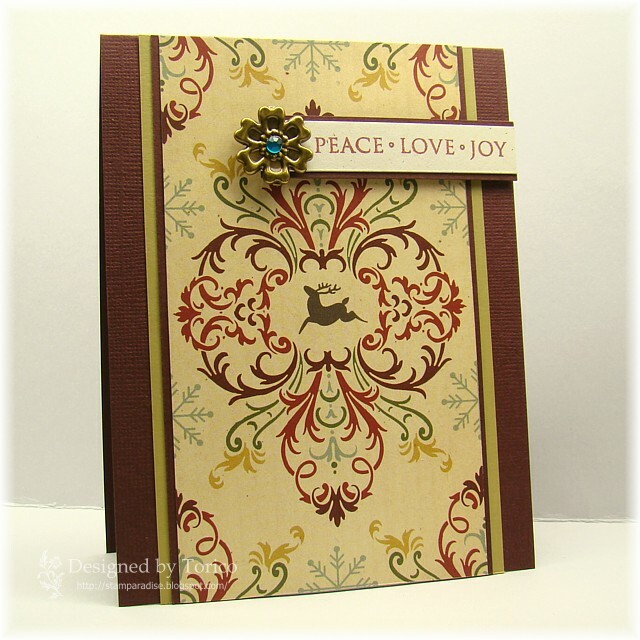 As I wanted to make this card cheerful, I chose brilliant colors. I colored my mouse with Copic Markers and cut it out. 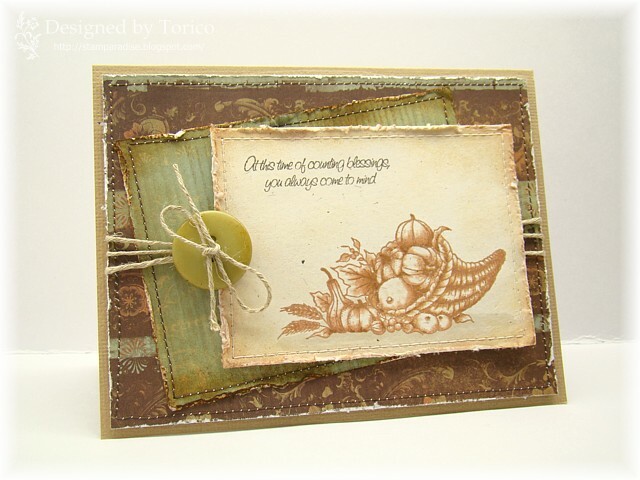 I paired it with MME paper (Alphabet Soup line), stamped the sentiment (from PTI) , and added a few buttons. 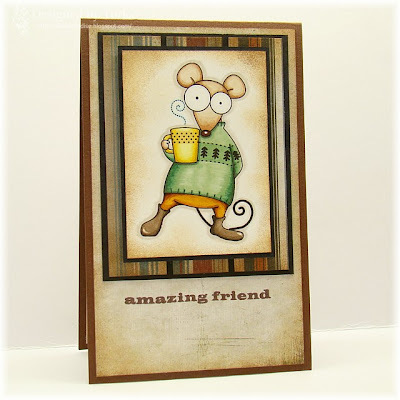 I've completed two new digi stamps and uploaded them over my another blog, Torico's Digital Gallery! Here is a card I made using one of them. When my daughter looked at this image, she said "This kangaroo is cute!!" ... Oh my, he is not a kangaroo but a mouse. LOL! Anyway I love his funny big eyes which make me giggle. This card was used the CPS 189 sketch. I colored the image with Copic Markers. I hope you like him, and if so, you can download it for free from HERE. I promise you to show you a card using another new digi image in a few days. Happy Sunday! Hope you are having a wonderful weekend so far! Each card measured 3-1/2" square. 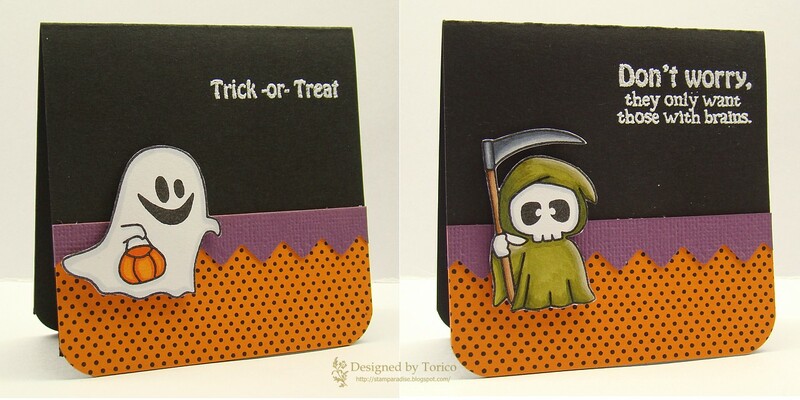 Each character was stamped , colored with Copic Markers, and cut out. 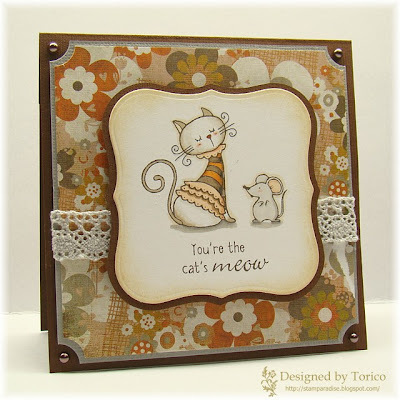 I stamped a polka dot background stamp (PTI) onto orange cardstock﻿, then adhered it onto black card base. I added purple puched borders and attached characters with dimensional tape. 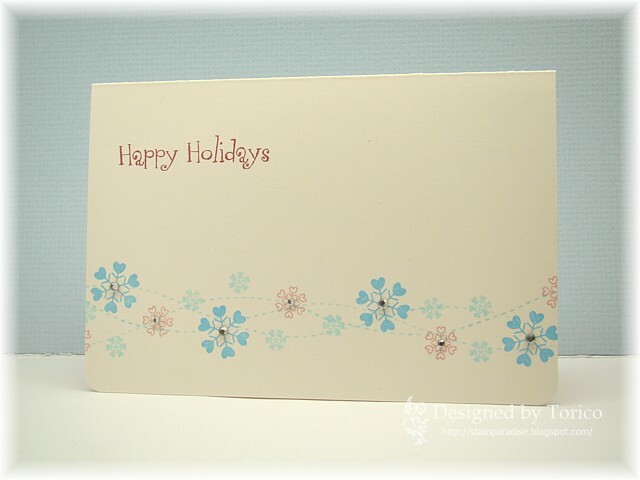 The sentiments were stamped with Versa Mark ink and heat-embossed with white EP. 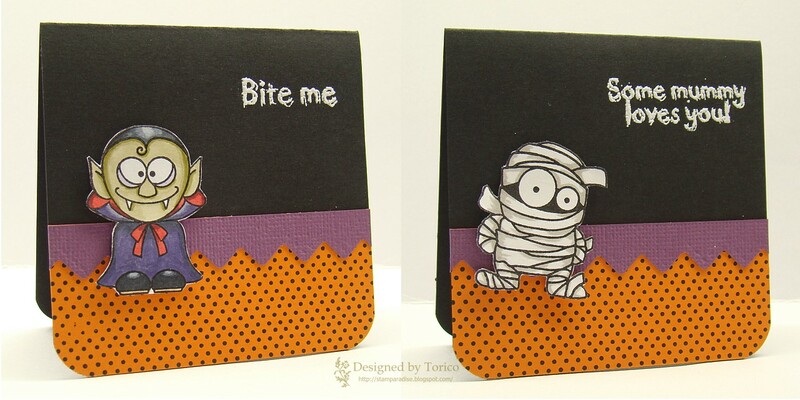 I wanted to share with you a Halloween card I made last night. I combined two challenges on this card --- ColourQ Challenge #54 and Kazan's Sketch #63. The stamp set I used is Hauntingly Delightful set (TSG). The mummies were stamped with Real Black ink (Versa Craft) and colored with Copic Markers. The sentiment was stamped with Eggplant ink (Versa Magic). 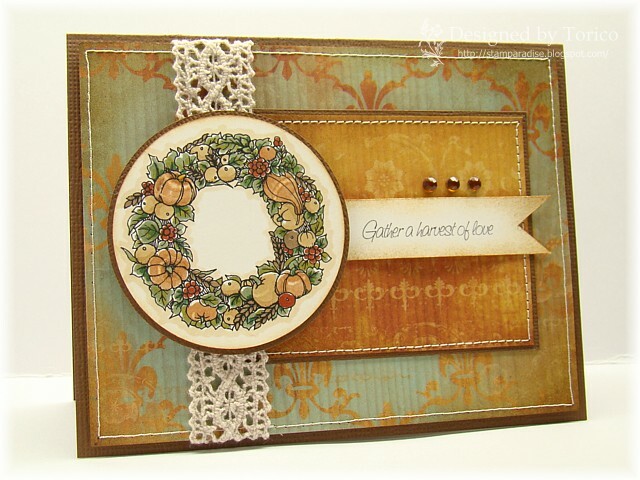 I sponged the edges around the circle panel with Antique Linen and Vintage Photo (Distress Ink). I put the focal panel together with Matilda paper (Cosmo Cricket) and Bazzill cardstocks, and added some olive green twine and a couple of buttons to finish the card off. Hello everyone! I hope you are having a wonderful week so far. 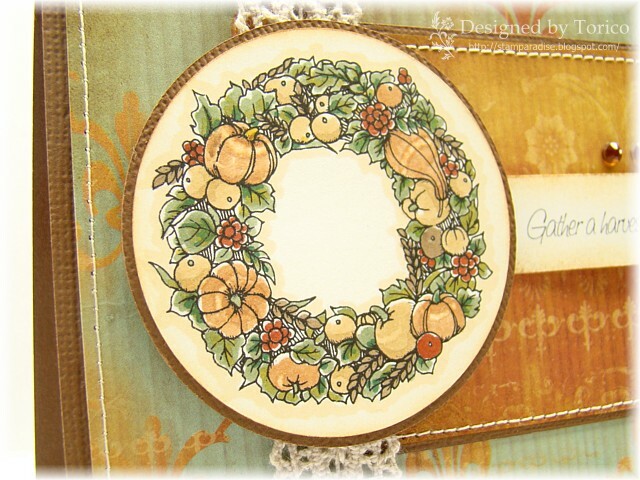 The card I'm sharing today is for this month's Artist's Garden Place Challenge (AGP #3). Their keyword is "Long Live Laughter" and the color we are required to use is pink. So here is my take. I found these pretty roses at a local craft shop a few days ago. I thought these roses would not fit well with my recent style, but I couldn't help getting them as they were so beautiful! The sentiment is from Angel Mail set (TSG). I really love all of the sentiments included in this set. They are perfect to cheer up somebody who is in trouble. Thank you for stopping by. I'll be back soon with another card I made last night. ;) See you soon! Today I just wanted to play with Spread Your Wings set (from TSG) that was delivered to me last week. So I decided to make an elegant card using CPS 188 sketch. 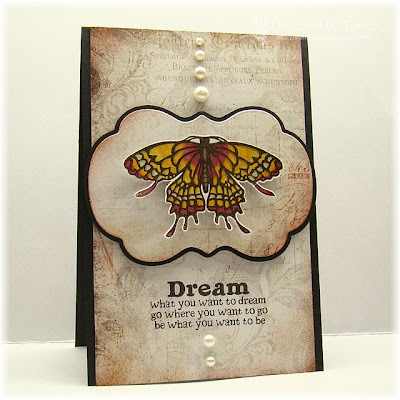 I stamped the beautiful butterfly with Espresso ink (Versa Craft) and heat embossed with clear EP. (Sorry, I think it is hardly to see on this photo.) Then I colored it with Copic Markers. All edges of the focal panel and back panel were randomly sponged with Aged Mahogany and Vintage Photo ink (Distress Ink). 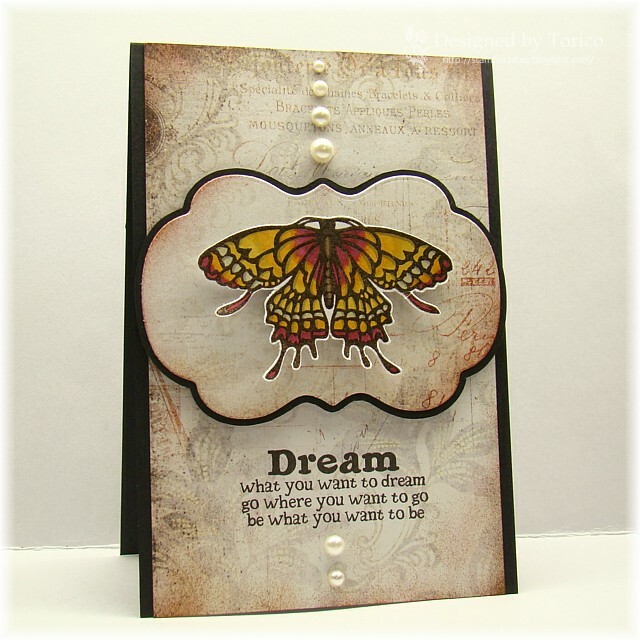 After I put together all panels and the butterfly, I stamped the sentiment with Midnight Black ink (Versa magic) and added some pearls to finish the card off. Today I made a birthday card for kids. This card was used the FTL 111 sketch. I didn't add the tab on the sketch as Natasha said that it was totally optional. 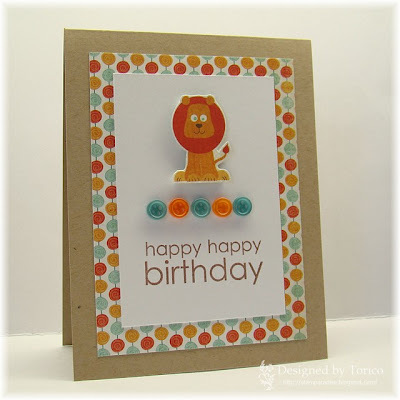 The adorable lion was cut out from one of a DP that is from MME's Alphabet Soup line and was attached with some dimensional adhesives. I stamped the sentiment with Cocoa ink (Versa Craft) and added several buttons matched to the DP. I'm also entering this card to this weeks Crazy 4 Challenges (C4C58) which is to create a birthday card / project. It is the second post for today. Luckily I got plenty time for card making today, and completed two cards!! Usually, I'm a kind of slow worker, so it is a miracle!! LOL! This card is for Case Study Challenge #9. 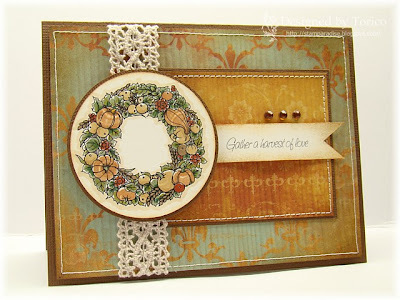 I kept the layout very similar to this week's inspiration card which was created by Barbara Anders. 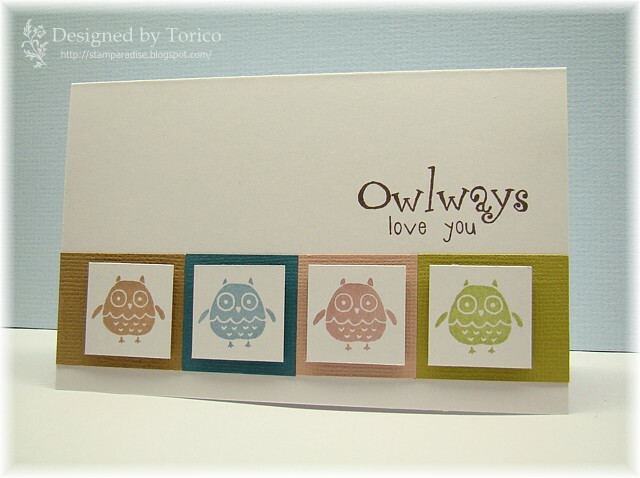 The stamp set I used on this card is You're A Hoot! set (TSG), and DP is from Basic Grey. The next one is for CPS 187. 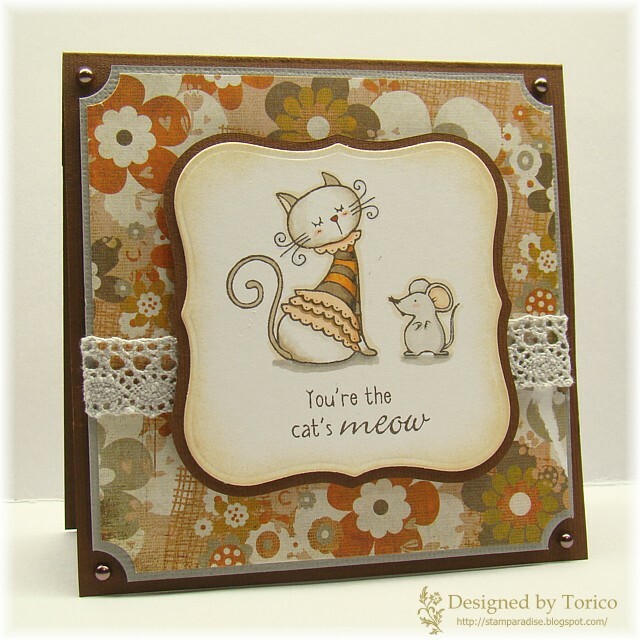 The image and sentiment are from Cattitude set (TSG) and gorgeous DP I used for a background is from Basic Grey. Actually, I didn't know what the words "the cat's meow" meant... lol! Of course, I consulted my English-Japanese dictionary, but couldn't find that idiom. So I had to google. At last I found the answer!!! I think it means "too cool". Right??? If it's wrong, please let me know! I'm sharing a CAS card that I made last night. 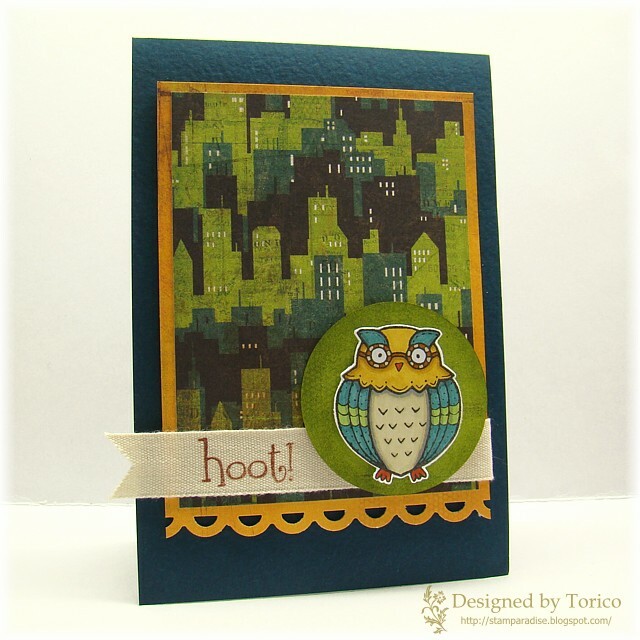 I used a silhouette owl stamp which is from You're A Hoot! set (TSG). Isn't it the cutest?? 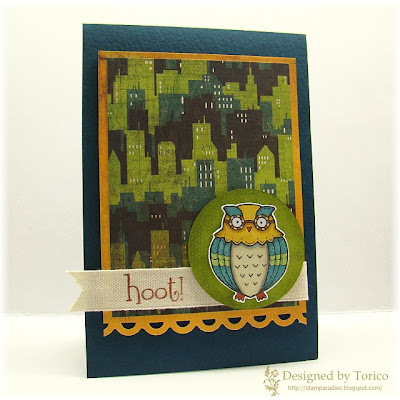 "Hoo" designed it?? LOL! All of stamps I used on this card are from Cockoo set (Hero Arts). I truly adore this image, but unfortunately I had not had any chance to use it till now. I'm very satisfied with the end result! I can hardly believe that today is already Tuesday?! 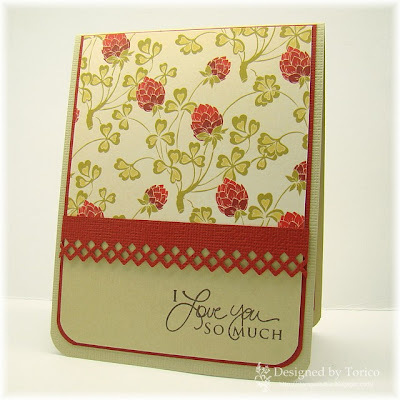 My weekend was crazy busy, so I couldn't get any time for stamping. 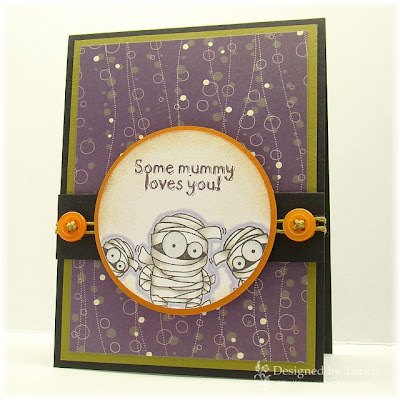 But today I finally got a little time for crafting, and created a quick card.